Some weeks ago, I dragged [c] to the Leopold Museum to visit the large retrospective dedicated to the oeuvre of Art Nouveau architect Joseph Maria Olbrich [1867-1908]. 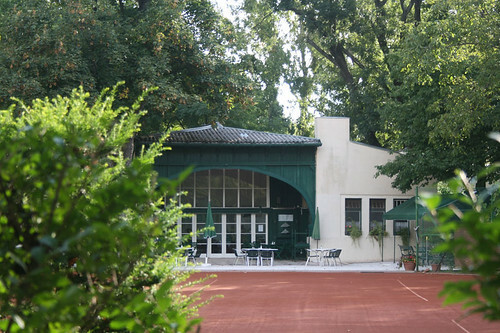 * Although Olbrich certainly was one of the artistic ‘masterminds’ behind the typical look of Viennese Art Nouveau architecture and a leading personality within the Viennese arts and crafts movement, his name is not as far-famed as for example those of his contemporaries Otto Wagner, Josef Hoffmann or Gustav Klimt. The large-scale exhibition presents over 300 works by Olbrich, including drawings, water colours, architectural models, furniture, textiles and tableware designed by this universal artist. Additionally, a wide range of old photographs help the visitor to grasp the feeling of the era, and convey a good sense of the intertwinement of architecture and interior design typical for the time. 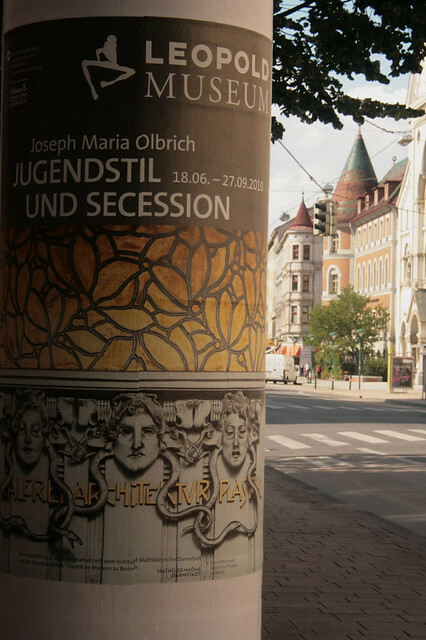 All in all, the exhibition was so inspiring that we decided to do some kind of follow-up by visiting the few but important architectonical imprints Olbrich has left within Vienna before he moved to the Darmstadt Artists’ Colony in 1899. 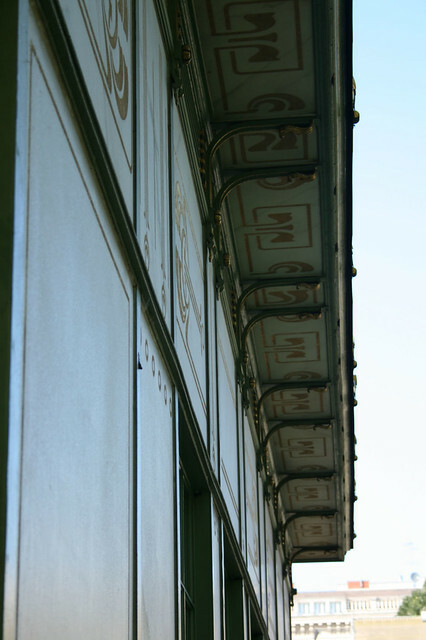 This is one of Otto Wagner’s famous Art Nouveau pavilions which were erected in 1898, in the course of the Stadtbahn [city railway] construction. 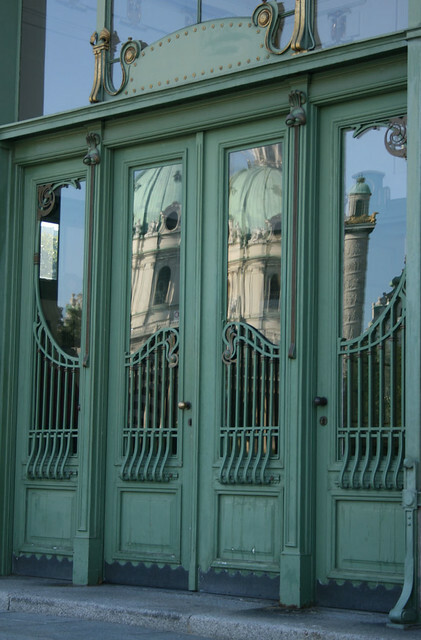 Wagner [1841-1918] was one of Vienna’s most influential architects and a very important leading figure in developing the modern architectural style the city would become famous for. 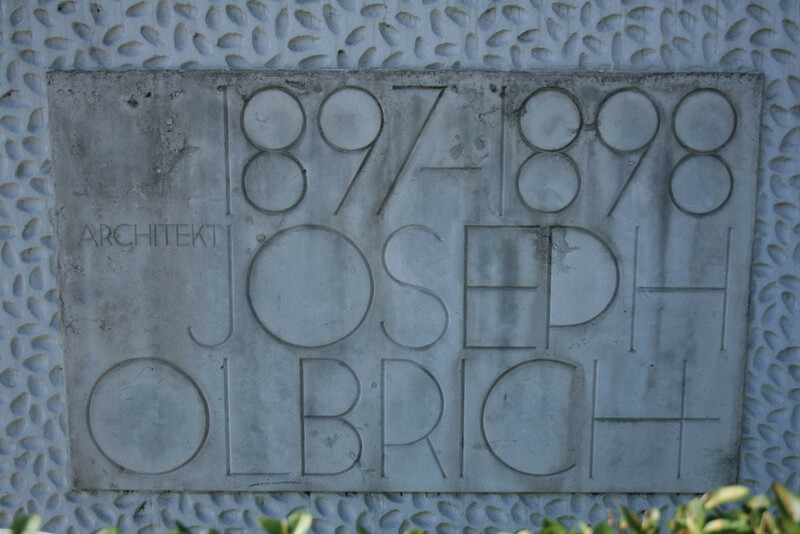 As the general planner of the urban railway he had a big company with numerous engineers and architects working for him, and in 1893, Joseph Maria Olbrich also joined Wagner’s agency. 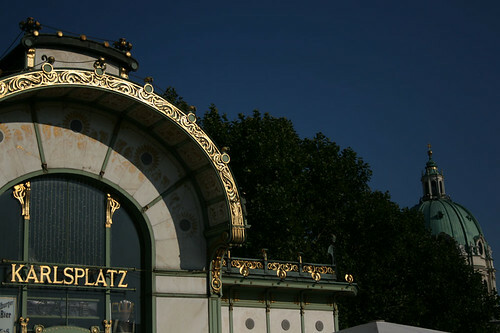 One thing we learned at the exhibition is, that most of the detailed drawings and plans for the Stadtbahn project were presumably sketched and drawn by Olbrich and that it is therefore very likely that a considerable part of those particular Viennese Art Nouveau features generally ascribed to Wagner, actually reflect Olbrich’s ideas and style.